A paradigm shift is underway in global petrochemical and polymer markets, as I discuss in a new article for ICIS Chemical Business. Previously successful business models, based on the supply-driven principle, no longer work. As our new study, “Demand – the New Direction for Profit”, explains, companies now need to adopt demand-led strategies if they want to maintain revenue and profit growth. But then the oldest Boomers began to join the New Old generation of those aged 55+. In the past, they would have died very quickly – life expectancy, even just a century ago, was only 46 years in the West, and 26 years in emerging economies. But major advances in healthcare, food/water safety, and personal lifestyles meant that the average 65-year old could instead hope to live another 15 – 20 years. Demand growth began to decline. The New Old already own most of what they need, and their incomes decline as they enter retirement. China had been responsible for more than half of the stimulus spending under the previous leadership. So its New Normal policies had a major impact on the global credit bubble. Since then, oil and commodity prices have collapsed, and economies dependent on exports to China have gone into recession. Global GDP fell by a record $3.8tn in 2015 in current dollars. Inflation is turning into deflation. But still, policymakers in the developed world refuse to accept that demographic changes are driving the global economy. Instead, they are creating even more debt – which can probably never be repaid. Please click here if you would like to download a copy of the feature article, and click here to download a copy of the Study brochure. It really is a clear and consistent track record. And it is far superior to the performance of financial markets, who find themselves at the mercy of central bank manipulation – with vast amounts of electronic money being forced on investors, who have to then bid up prices in response – as happened again, yesterday. So what do latest company statements tell us about the outlook in detail? The key issue is that we are moving into the New Normal world, as we discuss in our major new Study, Demand – the New Direction for Profit. China’s slowdown and the collapse of oil prices highlight that we are seeing a paradigm shift in demand patterns. Companies, as the chart highlights, can no longer rely on previously successful supply-driven business models. Instead, as I will discuss on Monday, we all have to relearn how to operate demand-led models again. “Debts have continued to build up over the last eight years and they have reached such levels in every part of the world that they have become a potent cause for mischief. Emerging markets were part of the solution after the Lehman crisis. Now they are part of the problem, too. Long-standing readers will remember that White was one of my guides in 2007-8, when forecasting the subprime crisis. 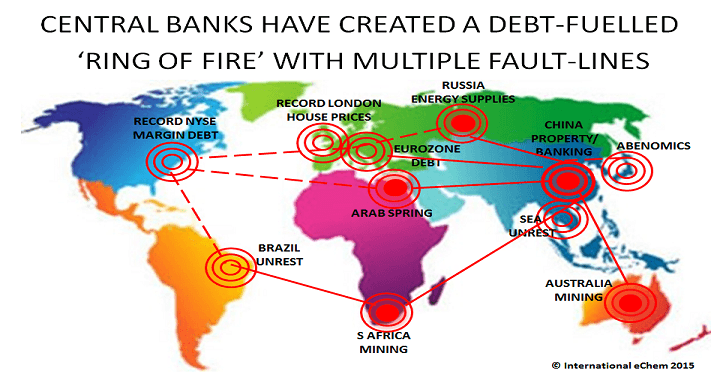 He was then Chief Economist for the central bankers’ bank (the Bank for International Settlements). I summarised his July 2007 Report in ‘4 risks to the world economy’, and the July 2008 Report as ‘The difficult task of damage control’. Unfortunately, I was one of the few to take him seriously. I will look at the potential implications of White’s analysis in more detail on Wednesday. This week’s economic data from Japan confirmed, once again, that demographic changes are far more important for the economy than monetary stimulus. Japan’s premier Abe took power in 2012, promising to end the decline in Japan’s economic growth. He appointed a new Governor for the Bank of Japan, and claimed that his “3 arrows policy” would quickly create an economic boom. But as the chart shows from the Guardian/Zerohedge, Monday’s data showed that Japan has gone back into recession again. “Unfortunately, however, this bold new initiative is also doomed to fail, for one simple reason. As in all developed economies, household consumption accounts for almost 2/3rds of Japan’s GDP. And Japan not only has the oldest population in the world (median age is 45 years). Nearly half of its population are over 50 and so are already in their low-spending years”. Instead, the main result of the stimulus has been to boost Japan’s financial markets, and to devalue the currency. It has been a wonderful ride for the speculators, as the Nikkei Index has soared from 8750 at the end of 2012 to a peak of over 20000 last August. Similarly the value of the yen has fallen over 50% versus the US$ over the same period. The Bank of Japan claimed this would boost inflation by causing import prices to rise, but this theory has also proved incorrect with Japan’s consumer price inflation back at 0% in September. Unfortunately, Abe’s failed experiment has not been cost free. The Bank of Japan began its stimulus programme in April 2013 by spending Yen 60tn/month, and increased this spend to Yen 80tn/month in October last year, making the total cost roughly equal to $1tn by the end of this year. This debt still has to be repaid, putting a further burden on the economy. And, of course, there is no guarantee that premier Abe will now abandon his failed experiment – as last year, he may simply decide to increase the cost still further. Even more worrying is that the lesson of the failure is still not recognised by other policymakers. Thus the European Central Bank seems likely to repeat Japan’s mistake of “doubling down” on its own stimulus policy, despite clear evidence that it has also failed to achieve the promised results. Before publishing the new Outlook each year, I always like to review my previous forecast. Past performance may not be a perfect guide to the future, but it is the best we have. Last year’s Outlook returned to the Scenario approach, given the potential for further policymaker stimulus. This provides a short-term ‘sugar-high’ for financial markets, which feast on the supply of free cash to push prices higher. There was indeed more stimulus from the Bank of Japan in November and from the European Central Bank in March. “The most likely Scenario focuses on the Great Unwinding of policymaker stimulus now underway. This is taking us into the final stages of the Cycle of Deflation, which has been building since the ‘dot-com bubble’ burst in 2000. “The key feature of this Scenario is that the world is now becoming demand-constrained. In the past, advantaged-cost supply was key to success. “If you build it, they will come” was the motto. “But today, it is becoming widely recognised that we have a supply glut in most key areas – certainly in energy and commodity markets, and also further down most value chains…. “Of course, deflation wouldn’t be a major issue today if markets had been allowed to operate normally after 2000. Most Western countries had moved into budget surplus, and were not burdened with today’s debt levels.